Not the time yet to come on out to the Mo this weekend. Or even next week. While a couple of the boat ramps have been cleared downriver, Craig, WC, and the dam are swamped with knee high to waist high snow. No access to the river per se. Dangerous conditions accessing the river. Deep, and not safe! Wade anglers. Not the time either. Yet. There is simply nowhere to park your vehicle. The snow has not melted, or been removed from any of the roadside parking spots. None of them. So you would have to park on the road. Even up at the dam. No parking available. This just in: UPS driver said a few cars/anglers parked on the frontage road, in the right of way, in the lane, in the road…creating safety issues. Not too smart man. Are you really ready to put not only yourself in danger, but others too? Adults don’t do stupid stuff like that do they? 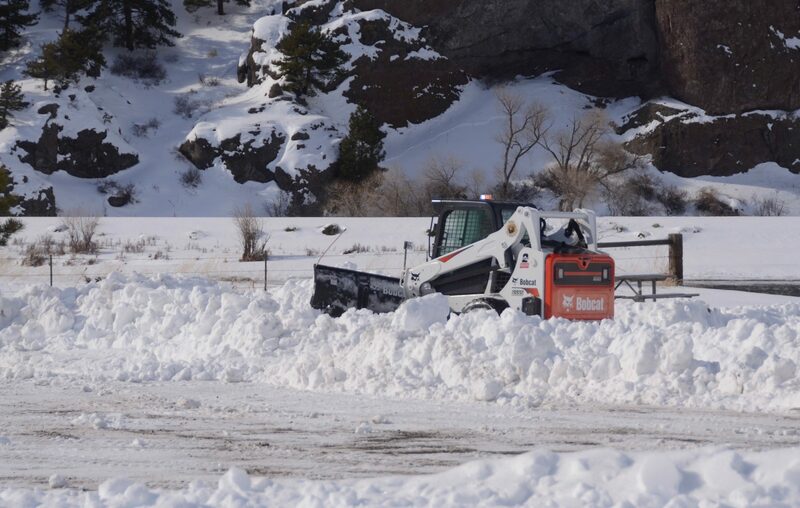 Sterling Ranch Co. has a “right of way” plowed in a couple spots, but those are not for anglers. They are for ranch employees that are facilitating cattle movement, birthing, and the like. They do not plow those spots out for you, our lovely friends, to park in. You may get into the river in a few spots. But the getting back out part will be damn difficulty and quite dangerous. Try crawling up a bank with 4+ feet of snow, or drifts, and the complications that can come from that situation. Dangerous to say the least. And…Shelf Ice the size of the fly shop floating around out there. Or Icebergs. Neither are too cool. Floating ice almost whacked a friend of ours a couple years ago. Like almost drowned, killed him dead. Honest. We here at Headhunters are not endorsing fishing right now. Unsafe. Unnecessary. No way. Not today. Maybe next weekend? If you do come and get stuck…don’t call us. Call a tow truck. This info is coming from a fly shop that has not put one penny in the register in 6 weeks. Too cold, no traffic, no anglers, not even many bathroom only stops. When you hear from a fly shop that they don’t want customers, following a retail dry spell, they must be serious. Lots and lots of phone calls from anglers in the past few days. Many are upset that we are telling them not to come. Hey listen pal, I’m not trying to ruin your buzz bro.’ We have enough content for the blog. We don’t need to write Memorial Posts for dead anglers. Nope. So, there you have it. We are sooo looking forward to sunshine, spring, rising trout, selling tons of pink flavored flies, and seeing your happy faces daily. We cannot wait for that to happen. But, unfortunately not happening quite yet. Be safe out there. Wait a week or better to come out and fish. Safety first! Headhunters is your safety expert here in Craig!